Mark Quickfall has crammed his wallet with a whopping 28.5 lakh rupees although Lady Luck wasn’t on his side. He and his buddies placed a ₹ 14,694 wager, which consisted of five different horse racing picks. Four of them were winning bets, netting the five friends a staggering 142.7 lakh rupees. They decided to split the winnings, despite Quickfall’s losing wager. While the lads were enjoying their day off work, 57-year-old Quickfall was finishing a job in Utterby. They would have earned an eye-watering ₹ 8.4 crore in cash if his bet had been a winning one. However, the foursome didn’t hesitate to share the stunning payout worth 142.7 lakh rupees with their buddy. 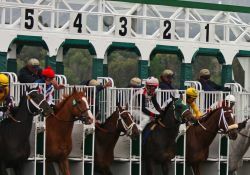 They placed the ₹ 14,694 bet at the Cheltenham Racecourse, according to local media. Needless to say that the five friends will continue to enjoy the excitement of sports betting. Quickfall runs a flooring installation company in his hometown, and he wasn’t able to join his buddies because of a busy period. “My friends suggested that collecting my share of the winnings could be uncomfortable because of my losing bet, but that’s definitely not the case”, the 57-year-old entrepreneur commented. He plans to use the payout to settle some debts, while he also plans to take his family on a trip to Dubai.